This highly visual study covers the US and Canadian truck manufacturers that built trucks in North America in the 1950s. Following World War II, North American truck manufacturers responded to the prosperity of the 1950s with fresh designs and features. These rugged, reliable trucks were capable of transcontinental commutes of goods on a regular basis, or performing delivery and construction tasks in and around cities. This concise volume covers not only the histories of the major and lesser known truck manufactures, but also the obscure, yet historically significant manufacturers such as Available, Biederman, Brown, Corbitt, Leyland Canada and others. 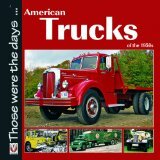 Comprehensive captions and supportive text combine with contemporary brochures, period literature, road test info of the day, factory photographs and over fifty colour photos of restored American trucks, to relate the importance of these historic vehicles. Detailed shots of the engines and features focus on what it was that set certain manufacturers apart in this highly competitive market. This succinct, factual book on American trucking provides a nostalgic look at a significant era in North American history.